I often have people ask me in the nursery for easy groundcovers that fill in fast, dense and don’t need attention. There are a lot of things to choose from in that category, but unfortunately most of them have a malevolent side- they don’t just peacefully occupy the ground, they are hell-bent on acquisition! Advancing, strangling, unrelenting invasive groundcovers are not usually what a person has in mind when they ask for something ’easy’. Especially when you can’t get it out again! Sedums are often my answer to groundcover in hot, dry or otherwise difficult sites in full or part sun. Juicy, delightful little plants that grow in horrible soils and come in a wide range of shapes and colours, Sedums can be stuffed in rock wall cracks, hung in a basket or planted in those shallow, impossible windowboxes that won’t support as much as a geranium through one hot day. Sedums are most often the plant of choice in green roofing, too- they thrive when fully exposed to the elements and given sharp drainage. Sedums can live happily where other plants fear to tread. 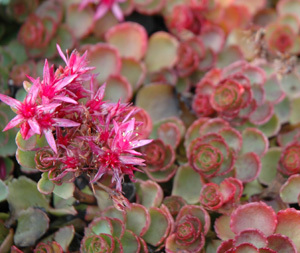 Sedums come in a dazzling array of colours, forms, shapes, growth habits and cold tolerance. The one thing I would watch for when purchasing sedums is the zone hardiness, make certain they will make it through the winter. Not all sedums love full sun either, there are a few that prefer part shade to quite shady, like sedum makinoi ‘ogon’ that sells itself with it’s cheery little lush gold leaves and then often disappoints if treated like other sedums and left fully exposed. Morning sun or partly shady conditions are best for this adorable gem. 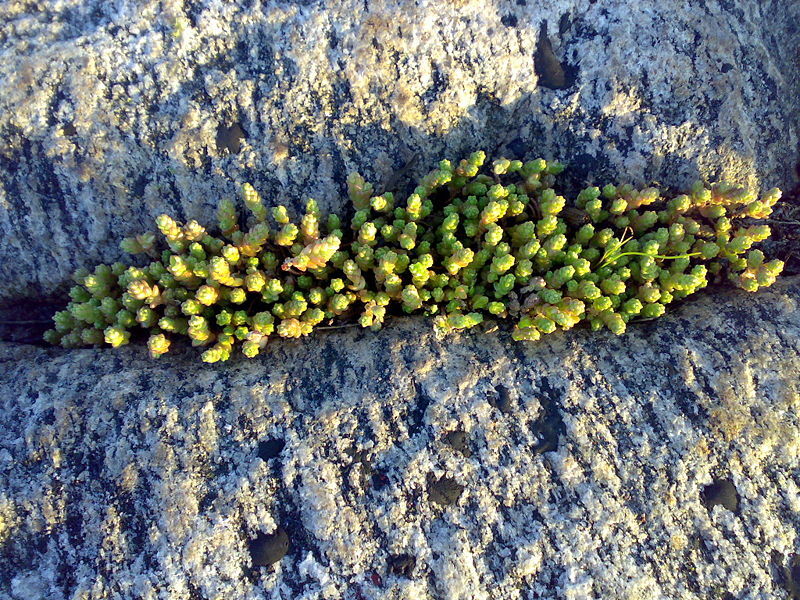 Sedum acre (aka ‘Wallpepper’ or a host of other names) will grow absolutely everywhere, and only the fact that it’s quite easy to remove redeem it from being a horrifically invasive plant. I like it as a green, matte base for slightly larger shrubs and perennials, it looks like moss from a distance and ‘takes’ fast and easily to cover the soil when I plant something new. It turns into a raft of bright gold when in bloom in midsummer. I find it to be reliably evergreen in zone 7 and it colours up with a wine tint during winter. Sedum spathulifolium has a special place in my heart- I love the look of it, a bold silver, and its original parent also a native plant. I’ve found it growing locally, but it’s never quite as silvery as the nursery cultivars. 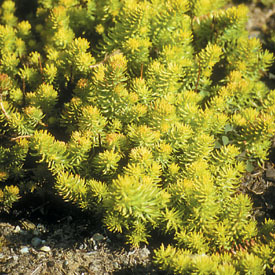 (Sedum ‘Cape Blanco’ is most commonly found.) I find it to be a bit slower growing than many, so give it some space or plant with less aggressive plants so it can show off. too, especially the ones you forget about in the corners (you know which ones!) Golden yellow, fast growing and holding it’s shape and colour through winter, this one is a crowd pleaser and fills in fast and dense almost anywhere. Sun exposure can change the colour, Angelina will grow in shade, but will be lime green instead of gold and not grow in as thickly. In full sun it will develop hints of orange in the yellow. And finally, my favourite red is Sedum spurium ‘Dragons’ Blood’. It has a good ruby colour in full sun and the pleasant bonus of almost red but actually really deep pink blooms that don’t clash with the foliage! It is not as lush during winter but still present and contributes some colour, in summer it’s that dash of deep wine-red that can be hard to achieve with hardy plants and is very striking with plain greens. For almost-black foliage try to find some ‘Voodoo’, it’s even darker than ‘dragon’s blood’ and looks great with silvery or gold foliage. Sedums are a large and diverse group of plants. Honestly, there are so many varieties and cultivars of sedum that I would need to write an entire book on the subject to begin to do it justice. Just take a look in your local nursery and see what they’re carrying this month- it is possible to plant an entire rainbow of sedums and there’s certain to be something you like the colour and shape of. Luckily, sedums are an easily reproduced plant. Small cuttings or big hunks are quite likely to take root if you simply toss them on the soil, but with a small amount of extra care you can have hundreds of baby sedums in very little time. One large pot can become the stock for an entire swathe of garden if you divide it up, and a small handful from a friend’s garden giveaways is a great way to start growing these agreeable ground covers. Simply tuck ends of sedum cuttings into well draining soil and give a little extra water in the beginning if the weather is dry and sunny to get them to root in quickly.